As many know, I am an advocate of social media. I use it a lot and encourage others to do the same. I also regularly teach workshops on how to use social media for personal, professional, and organizational uses. I enjoy the opportunity to help others with social media and connecting with others. I also enjoy helping people increase their professional opportunities through social media and have done workshops on that as well (as can be seen by the SlideShare below). Recently, while on LinkedIn, I realized that there was some good advice that I could pass along to people looking to maximize their profile impact and it had little to do with most of the content. I am going to take this blog post to discuss the most important part of your LinkedIn Profile: your profile photo. So the first thing you need to know is that you really do need a profile picture. It's not enough to just have your name on LinkedIn. There are many times when I'm looking at LinkedIn profiles and I only realized who the person is because of their profile picture. It's also relevant when you have a common name. If I see 3 John Smith's, how do I know which one is the one that I'm friends with? Yeah sure, I can go and look at all three profiles but a much simpler way for me to know is to see the profile pics. So for most people, you should have a profile pic. There are some exceptions, of course, but typically those exceptions have to do with people who need to keep themselves and their information private. But then again, those people usually aren't going to use social media. Okay, now that we know you should have a profile pic, what should the picture contain? These are some of the must-haves! First, the shot should be of you. You should not have a photo of your dog or cat. Trust me, I know this is tempting but it doesn't quite work for LinkedIn. In truth, the photo should only be of you with no one else in the actual picture. Again, if a person is looking at you for some particular reason, they will actually want to know which one is which. You also don't want to distract anybody from you if you are the subject of their search. You are the center of attention; so don't provide any distractions. Your photo should be taken in either a neutral location or a relevant location. By neutral, I mean a very simple background, such as a white wall, a building, or some other non-descript background. If you were to do a relevant location, be sure that it is clearly relevant. Sometimes, this is really easy. For instance, you might be a track coach and therefore, take your picture at the track. If you are some kind of manager, then a picture within an office space is probably a good shot. Don't take photos of yourself in ambiguous environments such as in the woods (unless you are seeking a job as a park-ranger or the like). Taking photos of you in interesting places may sometimes work but it is a gamble. I've seen some photos of people in interesting places. One person looked like they were in the midst of some kind of race, maybe a marathon. But I don't know that this entirely sits well with somebody trying to check them out professionally. Sure, it hints at a deeper person than just what their professional life is like but I could also see it distracting from the message in the content of the person's profile. Your picture should also be of high quality. Do not upload a pixelated picture of you to LinkedIn. 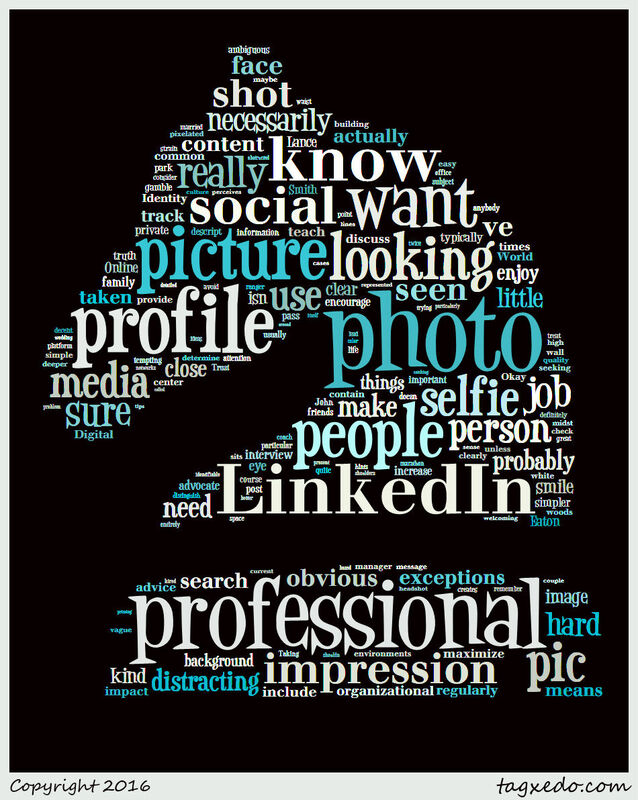 Nobody really wants to see a vague and hard-to-distinguish image of you. If I can't determine your eye color on a close-up shot, then it's not a good photo. Upload a picture that is well detailed. The photo should also be taken in a well-lit place. Don't make people should not have to strain to see you. Your photo should also be a reasonably close shot of you. This means it should either be a mid shot from the waist or ribs or even shoulders up or a headshot. Do not take a picture where it is hard to see you in the photo or it's hard to make out your face. Be sure to smile in your picture or at least have a welcoming look. Again remember, this is about first impressions. You generally want to smile when making first impressions. Along those lines, your face should not be obstructed. In some cases it might make sense. But mostly your face should be clear and identifiable. You want people to see you; that is the point of using a social media platform based on professional networks. Just a little bit more about things you probably shouldn't include as your profile pic. I've seen a couple people include their wedding photos or family photos. These are definitely not professional photos for your profile. It's great that you got married and have a family but that is not necessarily relevant to the job that you may be hired to do. Another pic that you would generally avoid is obvious selfies. There are probably a decent amount of profile pics on LinkedIn that are selfies. However, it's not necessarily obvious or clear that they are. For instance, my current profile pic is a selfie--but it isn't particularly obvious. It just looks like a close up photo. However if the picture looks like a selfie, then you might consider having somebody else take a better picture of you. The selfie itself isn't necessarily a problem. It's more about how our culture perceives people who take selfies. Again, this is a first impression. You want that first impression to be professional. Selfies don't really show professional. In the end, you want to treat your LinkedIn profile picture like the image you want to present to someone at your first interview for a job. Besides being an opportunity for a good first impression, it is creates the opportunity for a good second impression, should you be called for an interview. When you show up looking professional, you've now represented yourself twice as a professional and that could be enough to give you a lead. 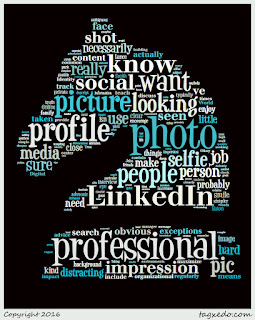 What other tips or ideas do you use when priming your LinkedIn profile to be eye-catching?